In the late 1980s, most college coaches thought that the 5'8 prospect by the name of Barry Sanders was probably too small to play running back. Sanders of course would go on to play for the Oklahoma State Cowboys and then spend 10 very successful years with the Detroit Lions of the NFL. He left the game as the third all-time in NFL rushing, trailing only Emmitt Smith and Walter Payton. Sanders capitalized on his size by running low to the ground, which made him a tough target for would-be tacklers. He also used his elusiveness and quick moves to slither out of tackles and change directions at the drop of a dime. Throughout his career, Barry performed at the highest levels but never let the fame and success get to his head. Off and on the field he was a model citizen and player, best known for simply handing off the football to the closest official after any one of his 109 combined career touchdowns. 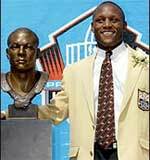 In 2004 Barry Sanders was inducted into the Football Hall of Fame in Canton Ohio. Only Gale Sayers and Jim Brown were younger than Barry at his induction ceremony. This was due to Barry's sudden retirement in 1999 after just 10 years as a pro in the National Football League. This website provides visitors with a glimpse of the great football running back, Barry Sanders. Included is a more detailed biography, career NFL and NCAA statistics and pictures of Barry Sanders and his rookie football cards. Copyright BarrySanders.info. This website is not associated with Barry Sanders.